Now an established 501(c)3 organization, we seek to serve as a community and regional resource for natural gas drilling information. We continue to welcome members with widely varying concerns, interests and ideologies, leveraging each other’s experience, expertise and information to best protect and preserve the physical and environmental integrity and safety of our area, as well as a way of life that generations of year ‘round and summer residents alike have come to treasure. 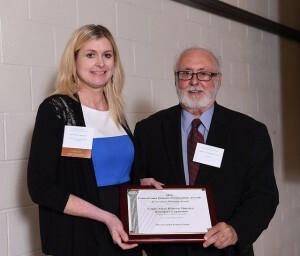 Shannon Baker, PEMA President, accepts the 2014 Preservation Planning Award from John Martine of the Preservation PA Board at a luncheon on September 23. Preservation Pennsylvania, the state’s only private statewide nonprofit organization dedicated to helping to protect and preserve historic places, has awarded its 2014 Pennsylvania Historic Preservation Award for Preservation Planning to the Protect Eagles Mere Alliance for its Eagles Mere Historic District Expansion project. In 1996, the Eagles Mere Historic District was added to the National Register of Historic Places, listing more than 300 buildings that exemplified the area’s history as a resort community, where families would come to enjoy the healthful benefits of clean air and mountain water. Recognizing the potential of the National Register accreditation to provide some protection from federally funded or permitted projects, PEMA spearheaded the expansion of the district boundaries. As a result of the approval of this project, approximately 98% of Eagles Mere Lake’s 435-acre watershed has now been added to the historic district, including the lake and 500 densely forested acres with a network of historic trails. PEMA President Shannon Baker explained, The new expanded designation will add a layer of review and possibly protection to areas that are of historic significance, now and for future generations. SEPTEMBER 4, 2011 COMMUNITY INFORMATIONAL MEETING 130+ people attended this PEMA Community Update program. The meeting was held in order to bring community members up to date on progress of the community leadership in identifying key risks and opportunities relating to natural gas drilling for Eagles Mere, discuss expert response to risk assessment to date, and to review the path forward. Click on this link to view the Power Point of the presentation. AUGUST 20, 2011 COMMUNITY LEADER MEETING this meeting was held to continue to work with community leaders to evaluate and implement best path forward to protect Eagles Mere by putting together a comprehensive opportunity/risk assessment that includes input from several areas of expertise. Experts presented information on zoning issues and hydrogeology concerns. Eric Guenther from FTI/G2 Labs will be in Eagles Mere the first two weeks of August to provide well water testing. This lab is state certified to do this testing with proper chain of custody procedures. If you are interested in having your water tested, please contact him at ASAP at eguenther@ftinc.net or 610-952-5299. Penn State Cooperative Extension Water Testing Information. This Web site contains a comprehensive fact sheet and other information on the the issues surrounding testing as it relates to gas drilling. Wilkes University Water Testing Information Web site also has a free booklet that you can download entitled Water Quality: Your Private Well. What Do the Results Mean? PEMA SUMMER 2011 ACTION PLAN Summer is here, and we have now had a chance to see many of you on the beach and about Eagles Mere. Many of you have asked those of us on the PEMA Board what’s going on?, what’s the plan? and how can I help? The purpose of this communication is to fill you in on all fronts. Click here to read the update. INFORMATION-SHARING – Disseminating the latest published information to a current member base of over 450. HYDROGEOLOGY (HG) STUDY AND FOLLOW-UP PRESENTATION – Continue to work with experts to evaluate data from HG Study and its impact on zoning/drilling issues. PEMA SURVEY – A survey of our e-mail subscribers was conducted in April 2011. Over 150 people responded, which was over 33% of our distribution list at that time. These results will provide feedback from the community and shape future goals. Click on this link to see the 2011 PEMA Survey Results. FALL/WINTER COMMUNITY LEADERSHIP MEETING this meeting (date to be announced) will be scheduled to continue to work with community leaders to evaluate and implement best path forward to protect Eagles Mere by putting together a comprehensive opportunity/risk assessment that includes input from several areas of expertise. This meeting is only for members of the Community Leadership working group by invitation only.